In a lovely coincidence, I happened to make Apple Strudel the same week that the lovely lads and ladies on the Great British Bake Off had a strudel challenge. It’s like it was meant to be. It probably had more to do with the 1kg of apples I had picked up at the market the week before that were judging me from their fancy fruitbowl. 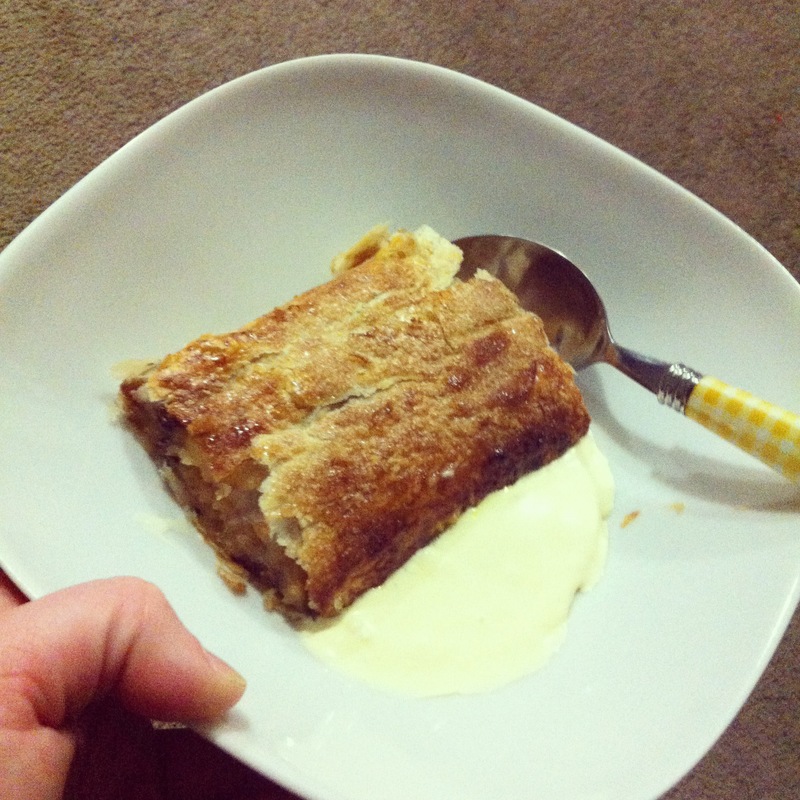 Whatever the reason, strudel was made and I carted it off to a dinner party/games night at a lovely friend’s home and it was a tasty to ending to a deliciously autumnal meal (yes, spring is here, no, I don’t accept it, AUTUMN FOR PRESIDENT). Disclaimer: We are a cooking blog, but we are people too. I find that I have things in my life that I prefer to do that don’t involve the multi-hour process to create butter puff pastry, so I tend to buy the fanciest brand I can afford from the frozen section and call it a day. If you can actually tell the difference, you impress me, because I’ve made many kinds and I really can’t. It is just not worth it to me for a casual meal, and if you can play with store-bought and get it to do what you want, I say take that extra time you have to drink a cider, eat some good cheese and pat yourself on the back for your excellent time management choices. One day we’ll probably do puff pastry and I’ll be all “IT’S SO WONDERFUL I DON’T KNOW WHY I DON’T MAKE IT ALL THE TIME”, and you can point me back to this post and heckle me if you like, I won’t care though, because no matter what, in the end, I’ll have a belly full of pastry! So, back to the strudel. I have a fear of runny liquid insides ruining my strudel, so these apples are cooked twice before they are rolled inside pastry for the final filling. This means that it is a very soft filling once cooked for the second time. All the apples collapse into the raisins and disappear into your tummy in seconds. I made two, and the four of us ate it all. Take pastry from the freezer and leave the two sheets out on a flat surface to defrost a little. Once soft enough to work with, lightly sprinkle with either flour or sugar and roll out until the dough is 1 inch wider on each side. Return pastry to the fridge until ready to assemble. Peel, core and chop apples. Line a baking tray with baking paper. In a large bowl combine apples, sugar, honey, cinnamon, cloves, nutmeg, ginger and melted butter. Mix using your hands. Once combined, dump out onto baking tray, spread out evenly. Roast in the oven for 15 – 20 minutes, or until they are golden brown and bubbly. Timing tip: Do this while the apples are baking. In a small saucepan combine raisins, honey, cinammon and boiling water. Bring up to a low simmer and stir occasionally until the raisins have plumped up and doubled in size. Strain the remaining liquid off into a large frying pan. Bring the liquid to a boil and quickly whisk in the cornstarch until all combined and bubbling. Lower heat to medium. Add the apple and raisin mixure to the frying pan. Stir gently to combine, leave to bubble away, stirring frequently to avoid the bottom burning, until most of the liquid is gone (this was about 5 minutes for me, but super juicy/dry apples will change this). Remove from the heat, spread over the baking pan from earlier and throw in the freezer for 10 minutes to cool down. Using a fork, whisk the egg in a small bowl until combined. Get your pastry from the fridge. Divide the apple mixture in half and spoon on to each sheet in a thick log on the edge closest to you, leaving a one inch border on the edge. fold the two side edges in and pat down. Gently roll the pastry edge closest to you over the mixture. Using a pastry brush, cover the exposed pastry with egg. Carefully begin to roll the strudel away from yourself until you reach the end of the pastry. Line baking tray with more baking paper. 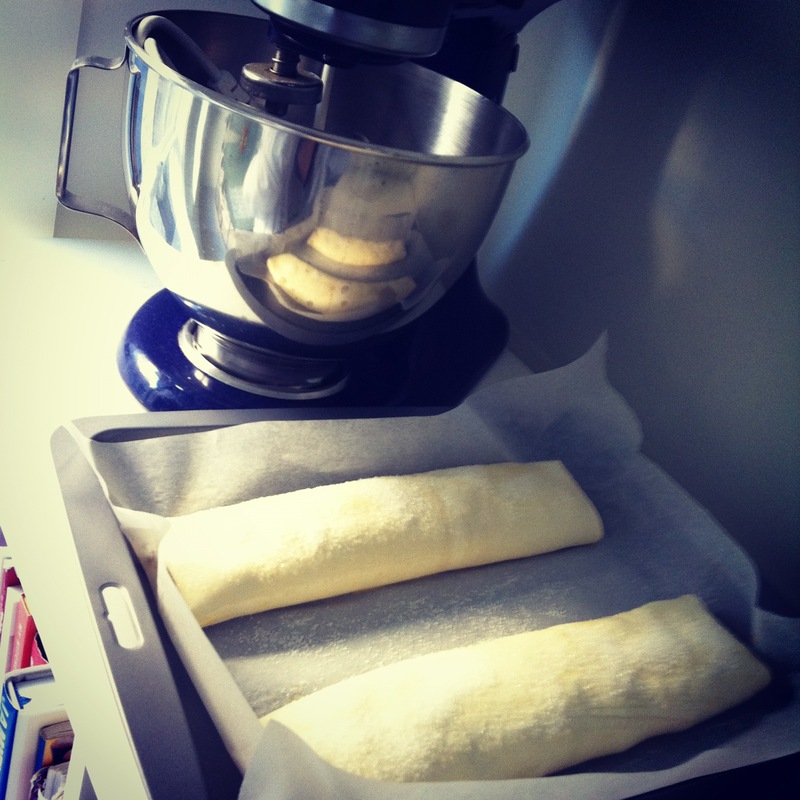 Place rolled strudels, with the pastry-join side down, onto the tray, spaced well apart. Sprinkle with sugar. Bake in a 220C over for 20 – 25 minutes or until deep golden brown and puffed up. Leave to cool for 2-5 minutes. Slice into pieces and serve with cream or icecream. Yum yum yum!!!! Katie have you left some of these in Melbourne for me to eat this week???? And I totally agree re puff pastry….it’s on my list of things to try and bake but just seems too worthless for the time and effort involved!